Welcome to my Creative Crone web page. Here you’ll find all the latest news and information about my novels, poetry, and upcoming workshops and appearances. You’ll find my latest blog posts, as well over 250 posts dating back to 2009, archived by subject matter and date. I’ve published three novels: Hope Dawns Eternal, Eldercide, and Mood Swing: The Bipolar Murders. All are available from Amazon in paperback and Kindle editions, or you can order them from your favorite bookseller. A click on BOOKS above will bring up all three covers, and another click will take you to descriptions, reviews and ordering information. You’ll even be able to read the first chapter of each book, and I hope you’ll be tempted to buy them. But why “creative crone,” and why now? I love the word “crone,” and I’ve identified as one ever since I reached the age of AARP eligibility. Then came the modest New York State pension I earned through my 13 years of work as a creative arts therapist at a now-defunct psychiatric hospital, followed by Social Security and Medicare. Now, in my mid-seventies, there’s no longer any doubt, and I embrace my cronehood proudly. In 2016, I began giving workshops on creativity for local writers’ groups. 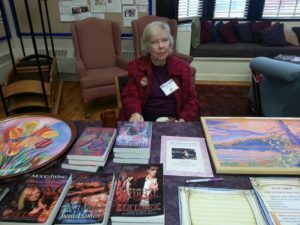 The feedback was excellent, and the interaction with the attendees was much more rewarding than anything I’d experienced while flogging my novels at author panels and signings. A few decades back, when I was a practicing art therapist, I’d given workshops on creativity and women’s issues at colleges and growth centers throughout the Hudson Valley, but I’d put that skill set aside until last year, when I decided to bring it back as part of my platform as a writer. Those workshops inspired my current book project, The Creative Crone, a blend of memoir, how-to exercises and inspiration. You can read more about it by clicking on the link above. The book project, in turn, led to the name of this website. Besides, “creative crone” is catchier and hopefully more memorable than my name, Julie Lomoe. My last name is Norwegian in origin, and there are only a handful of Lomoes in the United States, all of us related. But even friends I’ve known for years tend to misspell it, and I’m afraid it would be fiendishly difficult to find in search engines. I’ve been slogging away at a blog since 2009. For years I’ve been planning to launch a more exciting website, vowing to do it myself, but at long last, I decided to spring for a professional web designer. I’m excited about the results, and I invite you to explore. Please send me your feedback and suggestions. As time goes on, I’ll be adding more bells and whistles, including some video content. So please check back often, and tell your friends about www.creativecrone.net.